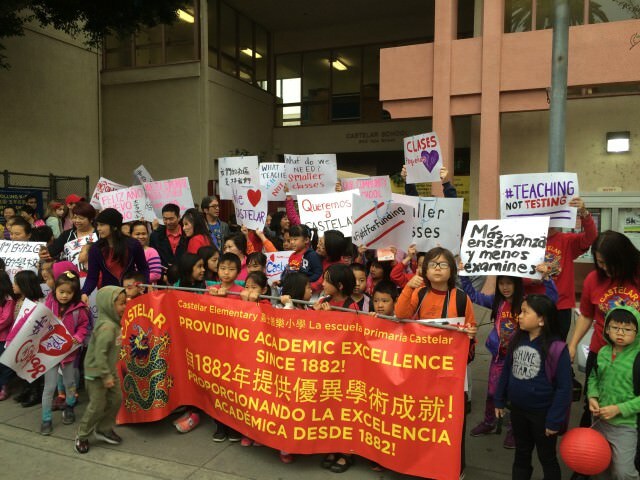 Parents, students and teachers rallied Wednesday at Castelar Street Elementary School in Chinatown. Several TV news crews were on hand for the demonstration, which saw parents, teachers and students march around the block hoisting banners and chanting before walking into the school. There were no speeches or news conference. The choice of Castelar as a focus for media attention was no coincidence, as parent leaders at the school recently stopped a planned co-location of a charter school there. The walk-in was part of a national effort organized by the Alliance to Reclaim Our Schools, with protests and rallies going on in cities around the country. UTLA took part in a similar national walk-in day on Feb. 17. The Alliance said rallies were planned in 80 cities Wednesday as part of the Reclaim Our Schools protest. According to Inouye, there were rallies planned at 150 LA Unified schools Wednesday, although it is unclear how many schools were the site of rallies. Because a focus was on co-locations, more than 500 charter parents signed a letter addressed to UTLA President Alex Caputo-Pearl asking him to stop the event out of concern for protests happening in front of students. “We will be shouted at, maligned and disrespected, our children will ask us what they’ve done wrong, and their teachers will, as always, be expected to rise above it all,” the letter said. Caputo-Pearl was not present at the Castelar event. A UTLA notice did not specifically say that rallies were planned at co-locations, and according to the California Charter Schools Association (CCSA), only one unidentified charter school was the site of a demonstration. Although there were multiple stated reasons for the rally in the UTLA notice, co-location was on the mind of the parents LA School Report spoke to at Castelar. The school has 570 students and is at about 75 percent capacity, according to the district. In response to Metro’s plans to co-locate, parents at Castelar recently gathered more than 2,400 signatures in a petition and lobbied to keep those classrooms from being shared. Metro has since canceled its plans to move into the school. Castelar has a reputation for high performance. LA School Report in September identified it as one of 16 schools with above average poverty for the district, an above average number of English learners and above average scores on the Smarter Balanced standardized tests. On the recent CORE accountability system, the school scored a 91 out of 100. The district average was 60. Unlike many of the UTLA-led rallies over the last year, the Castelar rally featured far fewer teachers and far more more parents and students, and it was parents holding the bullhorns and leading the chants. 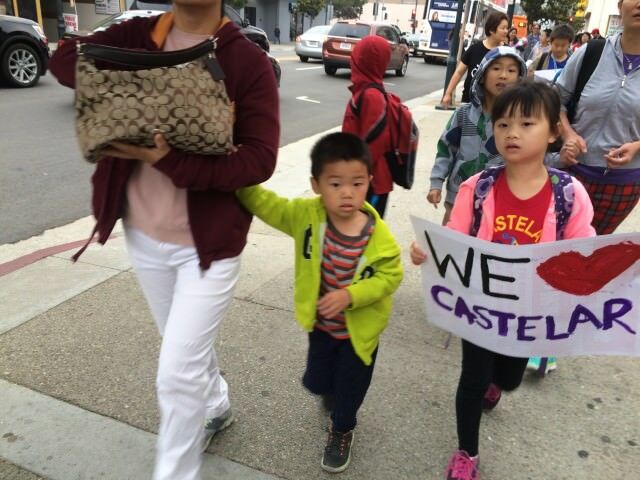 One of those with a bullhorn was Jasmine Wang, whose child is in kindergarten at Castelar. In her comments to LA School Report, Inouye referenced a larger battle her union is waging with the charter school movement as a nonprofit organization, Great Public Schools Now, finalizes plans to expand charter school access within the district. An early draft of the plan, which is backed by the Eli and Edythe Broad Foundation and the Walton Family Foundation, stated a goal to enroll half of all of the district’s students in charter schools within eight years, though it has pulled back from that figure in recent months. UTLA leaders, looking to degrade the plan and erode public support for it, use their own terminology when discussing it. “We have billionaires like the Broad-Walmart plan who have said they are going to take over our schools, take over half our district and turn them into unregulated charters. So this is a message to the charter schools, the California Charter Schools Association and everyone else that we want our public schools, and we will fight for them,” Inouye said. In response to Inouye’s comments, CCSA provided the following statement from Gloria Rodriguez, a parent of a student at Aspire Pacific Academy. “I’m one of more than 500 charter parents and supporters who signed a letter asking UTLA’s president, Alex Caputo-Pearl, not to disrupt charter school campuses today. I will continue to ask UTLA to stop spreading misinformation about charter schools and criticizing parents like me for seeking out the best possible education for my kids. It confuses me when they blame us and the choice we have made for our children rather than focusing their time and energy on making district schools better. Maybe if they did, parents would be lining up to get into the district schools just as they are lining up to get into my charter school,” Rodriguez said.